When planning the energy adaptations that will need to take place as the world begins its long-term transition to a decarbonized energy system, it is tempting to consider cost as the deciding factor in determining which kinds of low-carbon technology to develop. Sally Benson, Co-Director of the Precourt Institute for Energy and Director of the Global Climate and Energy Project at Stanford University, is well aware of this urge. She also believes that the overall picture is much more complex. At the outset of a talk Benson gave on February 9th at MIT, she said: “Cost may not provide all of the answers when it comes to making good energy decisions.” She explained that cost fails to take into account many elements of a new technology’s true price: co-benefits, short-term supply excesses and deficits, and un-priced externalities. Benson also pointed out that many early-stage technologies are too immature to accurately estimate costs at the outset, and that, in a similar vein, government subsidies often mask a technology’s real cost. She encouraged the audience to think differently about energy challenges and solutions by adopting a bigger picture approach that takes into account both the obvious cost-benefit flows related to energy and those that are more often hidden—a holistic view known as energy systems analysis. The “systems analysis” here can have many different meanings, from economy-wide macroeconomic modeling of an energy system to technology systems models that focus on a single kind of technology and its interlocking components. In each case, Benson explained, thinking in this way means that researchers “consider interactions and tradeoffs between different parts of the energy system” as well as “co-benefits of various technologies,” such as renewable energy technologies reducing pollution levels, or the development of hydrogen-powered cars paving the way for other lucrative uses of the same technology. She also stressed the importance of using multiple kinds of metrics to evaluate what kinds of clean technologies are performing best. To illustrate this tactic of tackling an energy challenge from all angles, Benson presented her audience with several case studies, including a look at sustainable growth of the solar photovoltaics (PV) and wind industries and an examination of grid-scale energy storage. In the case of PV industry growth, the energy-systems view involved analyzing device-by-device how much energy is produced and consumed — taking into account everything from building the unit to disposing of it at the end of its lifecycle. When this data is extended from a single device to the industry as a whole, researchers can compare the steadily increasing energy inputs with the energy outputs, which increase at an exponentially larger scale as the cumulative energy demand on the PV industry grows rapidly. With this in mind, the determination can be made that PV is now a net energy producer. As Benson pointed out, the wind industry is, as well — with an even better return on investment than the PV industry — 80-90. Benson took a similarly in-depth and intuitive look at the challenge of determining the best way forward on energy storage, and how to compare technologies. “What is the right metric? Is it efficiency? Is it power density, energy density?” she asked. 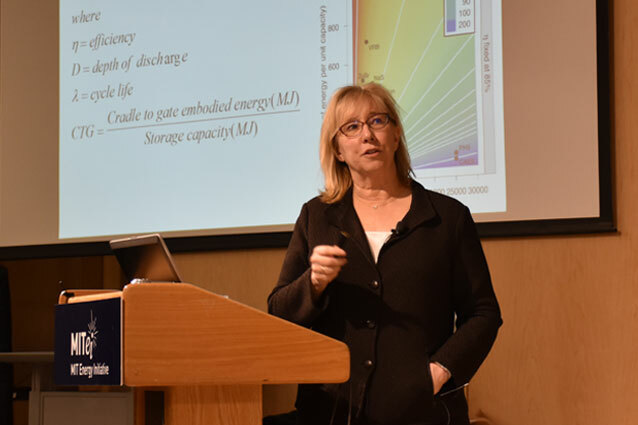 “Answering that is very complex.” She proposed an ‘energy stored on energy invested’ metric — a look at how much electricity a device is able to deliver back to the grid from storage, divided by the embodied energy that it took to manufacture the device. This talk was hosted by the MIT Energy Initiative as part of a series of seminars made possible by the generous support of IHS. This year, the Precourt Institute for Energy at Stanford University has joined the MITEI / US Department of Energy collaboration on the C3E Women in Clean Energy Symposium. The Symposium will be hosted at Stanford in May 2016.